Matt Smiths arm was raised before he crossed the finish line in the final round of Pro Stock Motorcycle Sunday in Pomona CA. 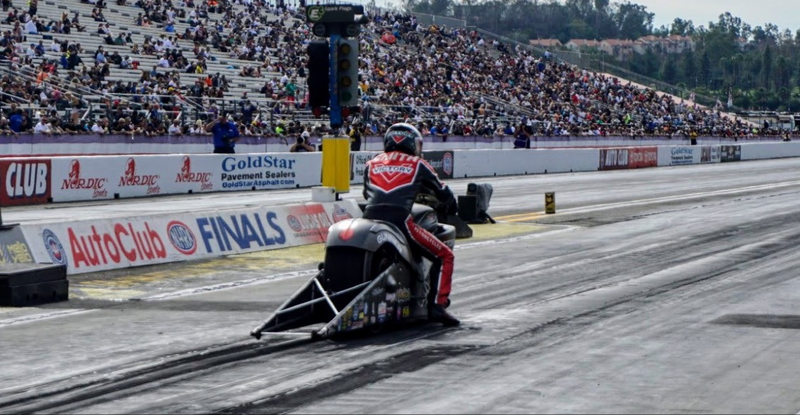 Matt grabbed his first win of the year and the first ever for Victory Motorcycles. The win broke a three-year winless streak for Smith but more importantly started a possible winning streak for the S&S powered Victory Gunner. Smith and the Victory Motorcycle team qualified 10th , riding the S&S powered machine to a 6.88 @ 193.99, meanwhile Smiths teammate and significant other Angie Smith qualified the second S&S powered Victory Gunner 16th with a 6.96 @ 193.82. The typically tight PSM field stayed true to form and Smith battled his way through a tough veteran field of Hector Arana in the first round, then won on a hole shot vs Eddie Krawiec by a mere 5 inches at the stripe. A win that would cost Eddie the championship as Jerry Savoie marched on through the second round. The third round brought Hector Arana Jr. along with a .018 reaction and another win light for Smith. Meanwhile Savoie takes out Victory motorcycles Angie Smith but loses to loses to Angelle Sampey in the semi-finals. Savoie still locks up the championship and three time Sampey moved into the finals against Smith. The S&S powered Sampey is a formidable opponent to say the least and she had qualified her S&S powered Buell 5th for the weekend and was on a tear through the field. As the tree came down Sampey pulls the trigger a bit too quick and goes red with a -.020. Smith rolled off the throttle and cruised to a well-deserved victory on his Gunner. Smith said -"It's been a long time coming – three years since I have won and the first one for Victory so it's pretty special." Smith and the team battled gremlins for a good part of the year but finished strong with a well-deserved win. Congrats to the Matt and team, we look forward to seeing the Victory Motorcycles Gunner blasting down the track next year.